On this day the explorers passed along this stretch of the Missouri River and camped a few miles north of here on the Nebraska side. The tranquil weather recorded by Clark in his journal for July 13 was in sharp contrast with violent storms the night before. Two notable incidents occurred on July 12. Private Alexander Willard was court-martialed for falling asleep on guard duty and sentenced to receive "one hundred lashes on his bear back, at four different times in equal propation." Captain Clark went a short distance up the Nemaha River, where he "observed artifical mounds (or as I may more Justly term Graves) which to me is a Strong indication of this Country being once Thickly Settled." This site is a prehistoric Oto village and cemetery. Near the mouth of the Nemaha River, Clark "observed Some Indian marks, went to the rock which jutted over the water and marked my name & the day of the month and year." No evidence of his inscription can be found today. 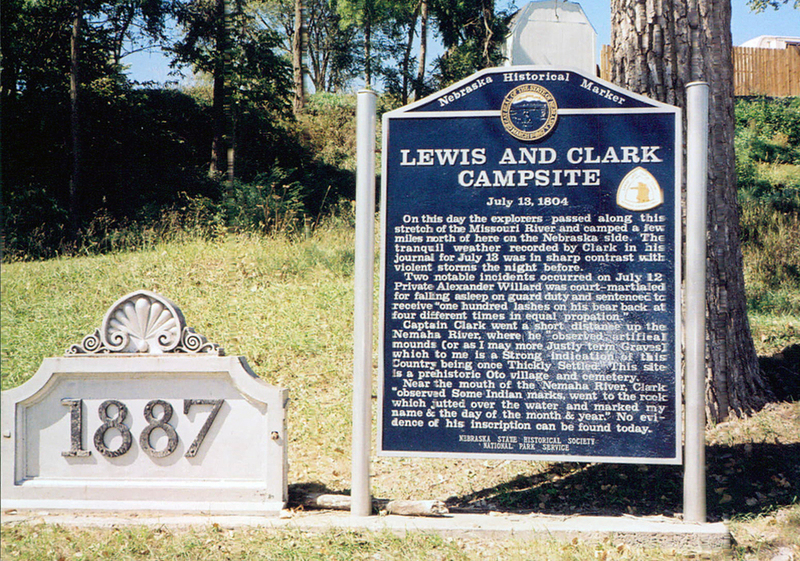 “Lewis and Clark Camp Site: July 13, 1804,” Explore Nebraska History, accessed April 19, 2019, https://mynehistory.com/items/show/432.